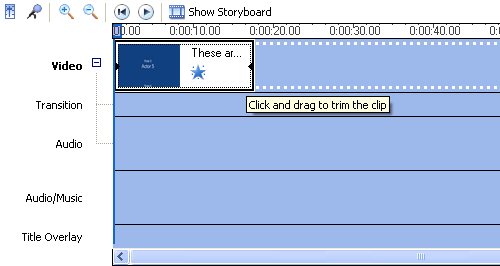 Anna writes, "My question is about Movie Maker - is there a control for the scrolling of the credits, i.e. to make them scroll more quickly?" 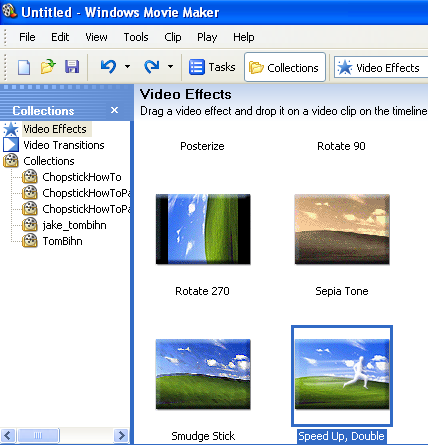 Windows Movie Maker includes an effect for speeding up video clips which works for both your movie clips and for the credits. The speed only offers one setting, which doubles the speed of the clip, making a 30 second clip playback in 15 seconds, for instance. With some creative stacking, you can use this effect up to 6 times to zip through your credits. After creating credits for your movie, scroll to the section of the video Timeline where your credits are located. From the Collections, choose Video Effects and locate the Speed Up, Double effect from the list of effects. Drag the effect onto your credits on the timeline. 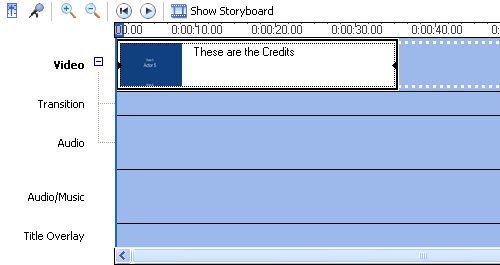 After dragging the Speed Up, Double effect to the timeline, there should be a little blue star on your credits clip in the timeline and the length of the clip should be half the original length on the timeline. Repeat these steps to add up to six Speed Up, Double effects to your credits as needed to adjust the speed. This same trick can be applied to any video clip to speed it up, with the caveat that a maximum of six total effects may be applied to any one video clip.